The anterior cruciate ligament (ACL) is one of four major ligaments in the knee. The four ligaments attach the femur (thigh bone) to the tibia (shin bone). The medial and lateral collateral ligaments are positioned at either side of the two bones and the two cruciate ligaments run diagonally in opposite directions to form an “x” shape between the two bones. The posterior cruciate ligament is situated towards the back of the knee and the anterior cruciate ligament is situated towards the front of the knee. The anterior cruciate ligament works together with the other major ligaments in the knee to provide stability to the knee joint. It’s the ACL’s job to prevent the tibia (shin bone) from sliding out in front of the femur (thigh bone) (known as anterior tibial translation), and to prevent the knee from twisting excessively. What are the main causes of ACL ruptures? Anterior cruciate ligament ruptures can be caused by a sudden stop and/or excessive twisting of the knee joint, for example due to a sudden change of direction. A direct blow to the side of the knee or sudden stress to the knee joint, for example when landing after jumping from a height, can also cause damage to the ACL. The injury is common in sports such as skiing, basketball, football and rugby. Why do women have an increased risk of ACL rupture in comparison to men? Research and statistics show that women have an increased risk of ACL rupture in comparison to men. Some possible reasons for this include differences in body shape, muscle use, and ligament laxity. For more information about each, click the buttons above. Women have wider hips than men, which can result in the thigh bone (femur) slanting inwards towards the knee and meeting the shin bone (tibia) at more of an angle (known as the Q angle). This places increased stress on the knee joint, making an injury more likely. Studies have shown that women tend to use different muscles than men for knee stability when participating in energetic activities such as running and jumping; a factor which adds to their increased risk of injury to the ACL. Women typically use the quadriceps muscles at the front of the thighs, whereas men tend to use the hamstrings at the back of the knees, which are more effective at protecting the ACL. Possible reasons for this include the slight difference between men and women in the position of the bones which form the knee joint; a result of women’s typically increased Q angle. In general, women’s joints tend to be more flexible than men’s, due to “looser” or more supple ligament tissue. This increased flexibility, or hyperextension, can affect the stability of women’s joints. Increased hyperextension of the knee can result in a slight backwards curve of the joint when the leg is straightened, which increases the risk of anterior tibial translation (the shin bone sliding out in front of the thigh bone) and makes sprains more likely. Suggested reasons for the increased flexibility of women’s joints in comparison to men’s include the increased level of certain hormones such as oestrogen in women’s bodies; however, not all researchers agree on this. ACL injuries can be divided into different classifications depending on their level of severity. For more information about these classifications, click the buttons above. Partial tears of the ACL are quite rare. Most tears tend to be complete. Conservative, or non-surgical treatment, may be recommended for elderly or less active patients with ACL ruptures, but generally surgery is preferred. Conservative treatment can include physiotherapy and anti-inflammatory medication. Surgical treatment is commonly used rather than conservative treatment. 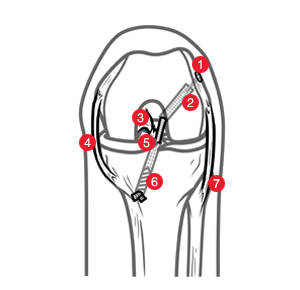 For information about some typical surgical techniques for repairing ACL ruptures, please click the buttons above. In an autograft procedure, tissue is taken, or “harvested” from another part of the patient’s body and implanted at the site of injury to repair the anterior cruciate ligament. Autograft tissue for ACL repair is most commonly taken from the quadriceps, patellar or hamstring tendons. Disadvantages of autografts can include weakness in the area from which the harvested tissue is extracted. This is known as donor site morbidity. Autograft tissue also tends to debilitate (lose strength) when it is harvested, as the tissue suffers necrosis (tissue death). Some strength is gradually regained after implantation, but this can mean a longer recovery period. Alternatively, allograft tissue can be used to repair a ruptured anterior cruciate ligament. This is similar to an autograft in that harvested tissue is implanted at the injury site. However, unlike autograft tissue, which comes from the patient’s own living body, allograft tissue is cadaveric and comes from a donor. Neoligaments’ JewelACL is a synthetic ligament device constructed from polyethylene terephthalate (polyester) and treated with a proprietary gas plasma treatment process which encourages tissue ingrowth and makes for a stronger repair. The JewelACL has been designed specifically to repair the anterior cruciate ligament, and can be used in either partial or total tissue graft sparing reconstruction procedures. The open weave sections of the JewelACL encourage tissue ingrowth, which makes the repair stronger and more secure. The JewelACL can be implanted either as a standalone device to eliminate morbidity (total tissue sparing), or in conjunction with a single hamstring tendon to reduce morbidity (partial tissue sparing). The tubular structure has suitably placed openings which allow a hamstring tendon to be placed inside. 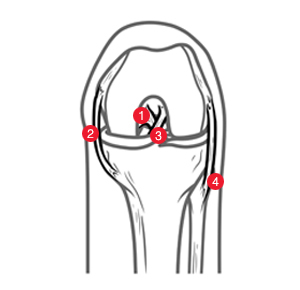 When doubled over and implanted in the knee joint following Neoligaments’ dedicated surgical technique, the strength of the JewelACL is similar to that of the natural ACL. The surgical technique is minimally invasive, using small incisions so as to reduce postoperative scarring. In a partial tissue sparing procedure, the JewelACL is used in conjunction with a single hamstring tendon, which is placed inside the synthetic device. Reconstruction procedures which use harvested tissue from the hamstrings typically use two hamstring tendons, so using the JewelACL in conjunction with only one hamstring tendon means that donor site morbidity and weakening of the hamstrings are reduced, as less tissue is taken. Although the harvested hamstring tendon will still lose strength, which it will need to regain in the postoperative period, this will not lengthen the recovery time as it would if the harvested tissue was used alone. The high strength of the synthetic implant, which encloses the hamstring, is consistent and allows early mobilization and rehabilitation. With the knee flexed at 90˚, a series of small incisions known as “portals” are made at either side of the knee. A single hamstring tendon graft is harvested through the small incisions using long, thin surgical instruments. Each end of the graft is whip-stitched with sutures (stitches) to a length of approximately 35-40 cm. The ends of the sutures are threaded through a thin surgical instrument called a “passing pin”, which is then passed through the openings in the JewelACL implant and used to place the tendon inside the JewelACL. The JewelACL and tendon are attached to a fixation device, the EndoButton CL Ultra, which consists of a small loop threaded through a titanium button. The implant is passed through the loop and folded in half to create a two-strand graft. The knee is flexed beyond 90˚ (typically 130˚) and using the small incisions to gain access, bone tunnels are drilled in the bottom of the femur (thigh bone) and the top of the tibia (shin bone). The knee is returned to 90˚ of flexion. Sutures are used to thread the EndoButton CL Ultra and the attached two-strand graft through the bone tunnels so that the graft spans the knee joint in place of the ACL. The titanium button sits on the surface of the femur, outside the entrance to the bone tunnel, and holds the top of the two-strand graft in place by means of suspension. The ends of the graft are secured at the entrance of the bone tunnel in the tibia using a screw, which is inserted centrally between them into the tunnel. The excess hamstring graft is trimmed at the tunnel entrance. 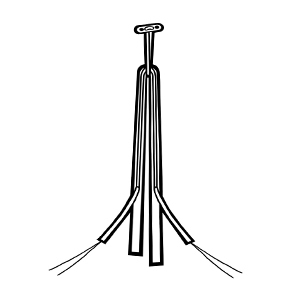 The ends of the JewelACL are tied using a reef knot over the back of the screw, and trimmed to length. In a total tissue graft sparing procedure, the JewelACL is used alone for the reconstruction of the ACL. This shortens both the surgery itself and the postoperative recovery period. The length of surgery is shortened, as the need to harvest and then prepare graft tissue prior to repairing the ACL is eliminated. Donor site morbidity and tissue necrosis are also eliminated, as no graft tissue is harvested, so other muscle and ligament structures in the knee are left intact. Because the JewelACL does not lose strength when it is implanted, as a tissue graft would, the postoperative recovery time is also significantly shortened. The JewelACL is attached to a fixation device, the EndoButton CL Ultra, which consists of a small loop threaded through a titanium button. The implant is passed through the loop and folded in half to create a two-strand graft. The ends of the JewelACL are tied using a reef knot over the back of the screw, and trimmed to length. Below is a brief outline of the prescribed programme following surgery with the JewelACL. If you would like to see the full rehabilitation programme, please click the link below. CPM is continued at between 20-90˚, but the range should be reduced to 20-60˚ if the patient experiences any pain. Active flexion and extension of the knee is initiated, with the patient wearing a brace limiting the range of motion to 20-90˚ of knee flexion. The activities begun in week 2 are continued. In addition, passive full extension of the knee is allowed twice per day. Partial weight bearing is commenced with two-handed support, e.g. crutches. Active flexion and extension of the knee is allowed to the patient’s maximum capability (usually between 90-110˚), with the patient wearing an unblocked brace which does not limit movement. Partial weight bearing is continued with one-handed support, e.g. a cane. Full weight bearing may be commenced, with no support. Extension training for muscles is begun, aiming at full development of range of motion. Light sports activities such as jogging or swimming may be commenced. Gradual return to sporting activities is permitted, dependent on the state of the muscles in the injured leg.